Several years prior to the start of the movie, an alien ship appeared over Johannesburg, but instead of moving on to another city or leaving altogether, the ship stalled, simply hovering miles above the city's inhabitants. After there was absolutely no interaction from them, the government intervened and cut their way into the ship, hoping to make first contact with extraterrestrials. What they encountered was much worse. 1.8 million aliens huddled together in the belly of the ship, malnourished and leaderless. 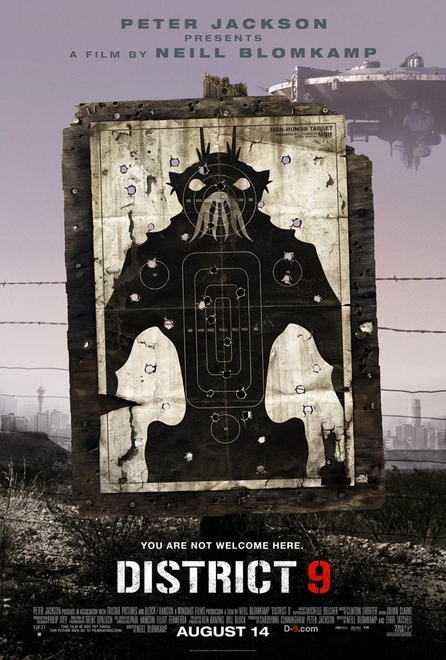 Feeling compassion for the creatures, the government created an area in which to house them: District 9. Soon after, the district became a slum, filled with crime and disease, and the people of Johannesburg began to complain. 20 years later, the complaints turned into riots, so the MNU stepped in and created a new housing area for the Prawns which is located several miles away from the city. This is where we join in on the action. 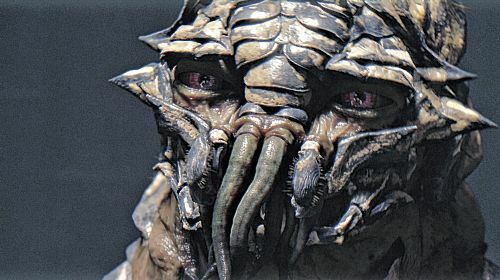 Wikus van de Merwe, as stated earlier, is preparing to visit District 9 for the sole purpose of informing the Prawns that they are being evicted and transferred to another location. While there, he finds a particular illegal stash belonging to a Prawn named Christopher (his government-given name, of course). In it is a tubular container, filled with a strange liquid that took Christopher 20 years to create. By accident, Wikus is exposed to this liquid and soon begins a transformation not un like the character in Kafka's "Metamorphosis" (I'll leave the gory details for when you see the movie yourself.). In the end, Wikus joins forces with the Prawns in an attempt to revert back to his human state, but he is forced to make a choice: Which is more important? His life or the lives of a newly gained friend (pictured above) and his son? You'll have to see the movie to find out what happens. I won't sugarcoat it. This movie is gory. Not Quentin Tarantino gory, but darkly gory. There are shots of people being eviscerated by an alien weapon, blown up, and decapitated (among other various and equally disgusting ways), and we all know how I feel about that (see this post). Not only that, but imagine this man's transformation from man into Prawn. Besides that, however, this movie is excellently executed. It's filmed in the style of a documentary, and I must say that I haven't seen a movie as deceptively real as this one. I believed that Wilkus was a real person and that he worked for the MNU. Additionally, there's the whole issue of the aliens. Now, we were alive during the 90's. We know that there was never an alien spacecraft hovering above Johannesburg. Despite that fact, however, I believed it. It also goes without saying that the acting was phenomenal. It's incredibly difficult to portray a character that seems like a person we talked to earlier that day, but these actors did it with ease. Impressive, says I. And then we have the special effects. The CGI was absolutely amazing. If I was completely shut away from the world and didn't know anything about the modern movie, I would have been absolutely convinced that this really did happen. That being said, I will most likely not be seeing it again for the sheer fact that my heart was racing the whole time. There was not one cathartic release throughout the entire movie, and 2+ hours of nonstop action just exhausted me. I was still shaking for several hours after the movie ended. Actually, funny story. I bought Jr. Mints on my way in to the theater, and when the box was empty, I proceeded to tear the box into pieces. Tiny, little, minty-smelling pieces. By the time the credits began to roll, over half of the box was decimated and laying inside the remaining portion of the box. The pieces I ripped were barely the size of my pinky nail. Stressful. Very, very stressful. But still excellent. Go see it, if only once. Whoa, this sounds amazing. I'll have to see if it is playing near me. I usually don't see movies like this (though I read books like this) If you massacred a Junior Mint box...! Sounds like you were on the edge of your seat the whole time. I'm certainly intrigued. Thanks for the detailed review. Hi Stef, my wife and I went to see it on opening weekend. It's been getting a good turnout at the theatres, I suppose because Peter Jackson threw his weight behind it. For those of us of the +45 set, we recognize the retlling of the apartheid story in S. Africa, and the resettling of the 'non-whites' in what was District 6. Definately a great movie and well worth seeing (liked that it was left hanging and set up for a sequel). Alan, Peter Jackson's name surely had some effect on the turnout, but I think that just helped with opening numbers. I think that it's doing well now because it's so great. I actually did a little research on the movie when I got home after seeing it, and I read about District 6. Very interesting stuff.